Records and displays web/cli requests, database changes, php/js errors and associated data. Installs as a simple module so it can be added without any hassle. You can either track specific actions and nothing else or exclude specific routes from logging (wildcard supported). View your data. The module contains a nice viewer that is automatically made available when you add it to your configuration. It has configurable permissions to limit access to this functionality by IPs, roles or users. user_id - User ID of the visitor (if any), based on Yii::$app->user->id. ip - IP Address of the visitor. request_method - The method used to generate the request, eg: CLI for console requests and GET, POST, DELETE, PUT, PATCH, OPTIONS or HEAD for web requests. ajax - If the page was requested using ajax. route - The controller and action of the request. duration - How long the request took to serve. memory_max - The peak memory usage during the request. created - The datetime the entry was created. Each panel is optional, and you can even create your own. URL Information including the route and params. PHP SuperGlobals $_GET, $_POST, $_SERVER, $_FILES and $_COOKIES. Headers from the Request and Response. AssetPanel - Asset Bundles loaded for the request. ConfigPanel - Yii and PHP configuration that was used for the request. 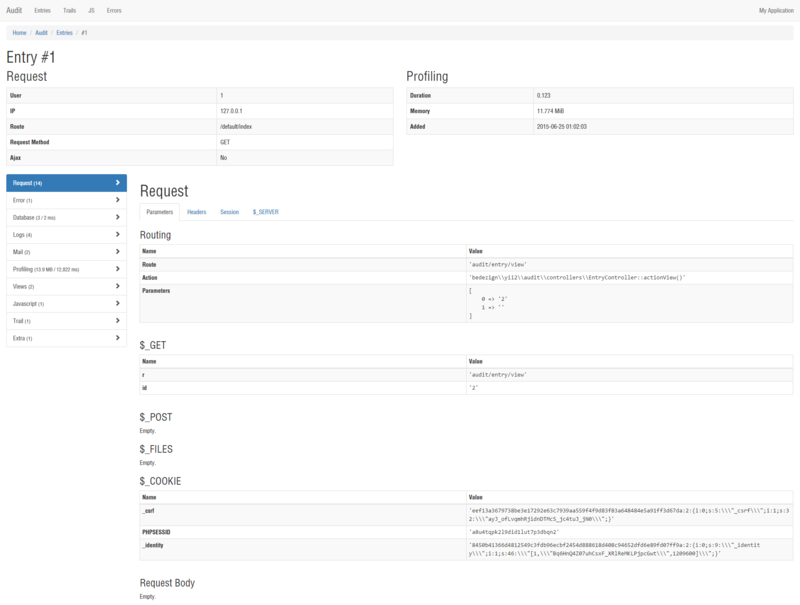 ProfilingPanel - Application profiling information. Getting started? Try the Installation Guide. You will find further information in the Documentation. For changes since the last version see the Changelog. More images are available from the Screenshots page. Contributions are welcome. Please refer to the contributing guidelines. BSD-3 - Please refer to the license. Found a problem with this page? Edit on GitHub or Create an Issue.